Top of the morning to you, friends! Are you baking all the gingerbread?! Are you planning to make this epic quiche for Christmas morning? I know you are! I went to the gym for the first time in a month yesterday. It feels good to be doing normal things again! Now onto the eats. 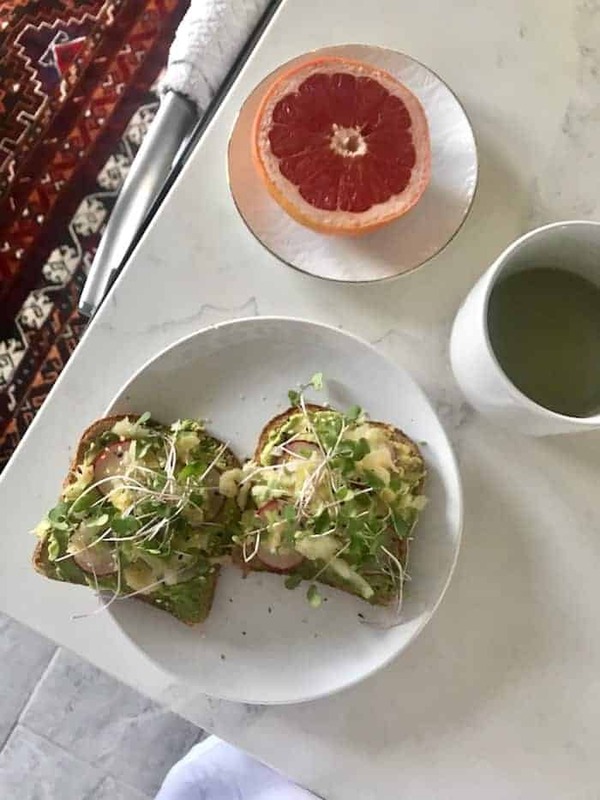 Breakfast was a couple slices of toasty sprouted sourdough piled high with avocado, sliced radish, caraway kraut, everything bagel spice, micro greens, and lemon juice. I basically only crave toast or pancakes lately (these banana ones are heaven-sent). I also had a matcha latte of sorts made with this amazing warmed maple pecan mylk I got in the mail from Malk Organics. I’m usually a coffee girl through and through but with feeling under the weather lately, matcha sounded much more appealing. 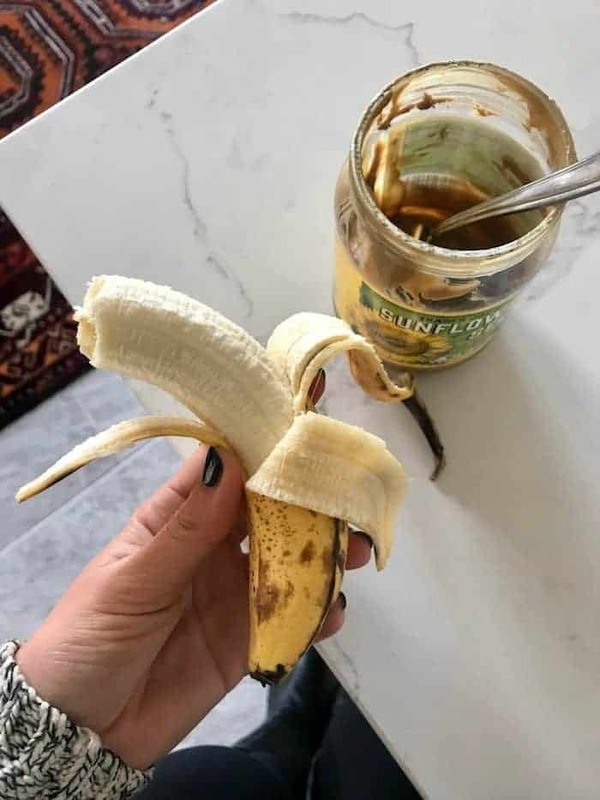 I was hungry before I left the house around 11am so I had a banana with sunflower seed butter on my way out the door. I’ve been eating lunch at one of the restaurants lately. One of the perks of the job! This is Alchemy Grandview’s Fiesta Green Salad with smoked salmon. 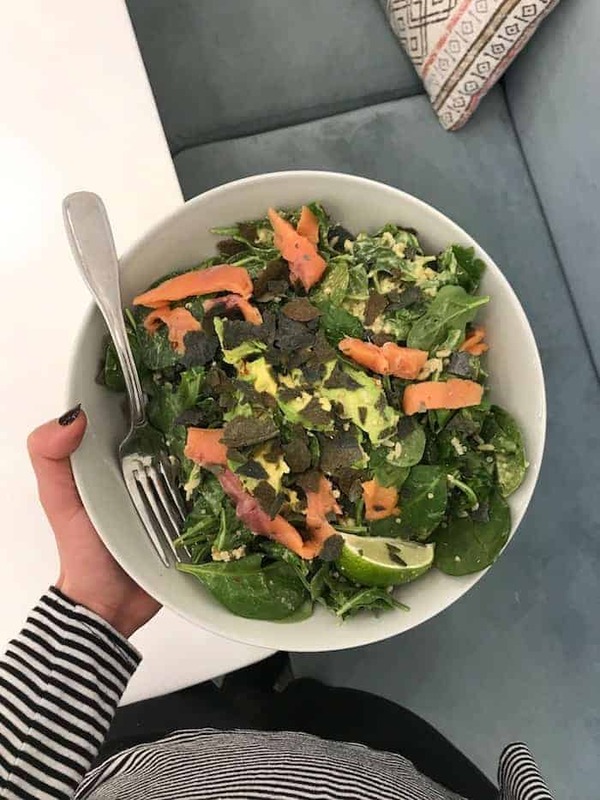 It’s loaded with ancient grains, avocado, black beans, peppers, charred pineapple, red onion, blue corn tortilla chips, and cilantro lime hemp dressing. SO freaking satisfying! 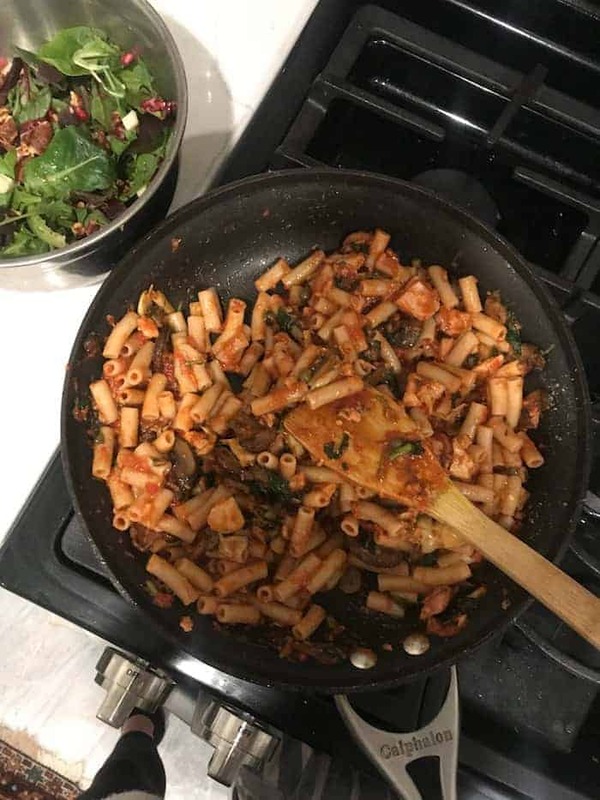 Dinner was a random Mediterranean pasta of sorts that turned out super good. First I boiled a bag Trader Joe’s brown rice penne pasta. While it was cooking, I sautéed 8oz of mushrooms in olive oil for a while until nice and browned. Then I added Kirkland marinara sauce, capers, marinated artichokes, some nooch, salt, red pepper flakes, and a can of tuna. Stirred in the pasta and voila! We had salad on the side with pomegranate, pecans, and aged cheddar. 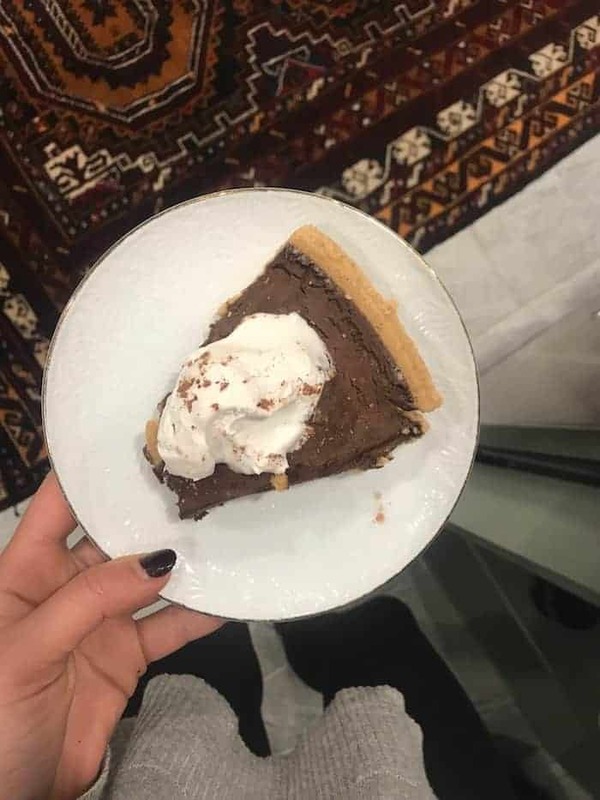 Dessert was a slice of my delish Vegan Peppermint Chocolate Pie. You guys, this recipe is SO easy to make and tastes incredible. I like to keep extra slices in the freezer and then microwave a slice for 20 seconds before diving in. 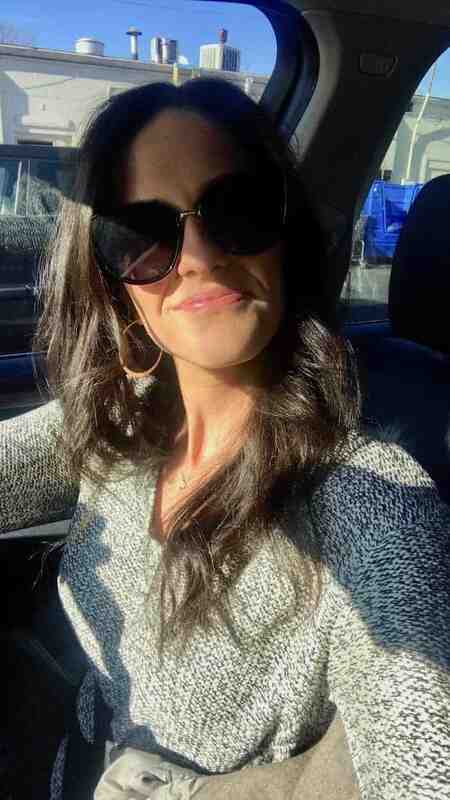 I don’t have too much style inspo for you, but these sunnies in the below picture are so cute and only $16! Here’s my $9 gold hoops because I lose jewelry (and sunglasses) like it’s my job. Also, I don’t talk much about makeup on here, but I’ve been wearing NARS Raquel lipstick for years now and it’s a game-changer. It’s an amazing pink beige color that’s neutral enough for every day but really adds a pop…like hey, I put in some effort today! Worth every penny. In other news, I’m loving these, these, and these Adidas tennies which are all 40-65% off. Aaaaand here’s a cute swimsuit if you’re lookin’! Here’s an adorable crop cardigan that’s only $28 and a super cute winter coat for 68% off. And if you need a last minute gift under $25, this Yeti mug is everything. Have the best week! I feel like it’s been a while since I’ve read your What I Ate Wednesday posts – or is it just my imagination? Either way, what delicious munches you’ve been up to! :) Mmm! omg that maple pecan milk sounds heavenly and so does your vegan peppermint pie!! how did I miss that recipe?!?!? maybe I can make it next week when I’m home for the holidays. hope you’re having a great one, lady! everything you post from alchemy looks so amazing….if i’m ever in the area it’s definitely on the must-do list!